Our mission at Prince of Peace is to proclaim the Good News of Jesus Christ, as it is revealed through our heritage and reflected in our hope for the future. We proclaim the Good News, that we were once condemned and deserving of death for our sins, but are now reconciled to God the Father by grace through faith because of the saving work of His son Jesus Christ, who is revealed to us through the Gospels of Mark, Matthew, Luke and John. Now we are spiritually alive in Christ, children of God and heirs of eternal life with our Heavenly Father. Hallelujah! You may find comfort in these two verses, "For God so loved the world that he gave his one and only Son, that whoever believes in him shall not perish but have eternal life" (John 3:16), and "God is patient toward you, because He does not wish for any to perish but for all to come to repentance" (2 Peter 3:9). 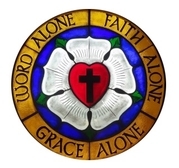 For over 500 years, since the Reformation of the Church, Lutherans have confessed they're saved by the Word alone, Grace alone and by Faith alone. For God's mercy is a free gift given to us. Ephesians 1:13 says, "You were included in Christ when you heard the message of truth, the gospel of your salvation. When you believed, you were marked in him with a seal, the promised Holy Spirit." We have peace through Him, because our sins have been atoned for by the shed of His blood. We’re saved, but we know we're sinners too. "If we say that we have no sin, we deceived ourselves, and the truth is not in us," but "if we confess our sins, he is faithful and just to forgive us our sins and to cleanse us from all unrighteousness" (1 John 1:8). We put our faith in Him, for "God views the person who has faith to be righteous in His sight" (Romans 3 & 4). So that everyone might receive faith, God established the ministry of teaching the gospel and administering the sacraments. For the Holy Spirit is given to people through the Word and sacraments, which are the tools through which God works to transform hearts. "For it is by grace you have been saved, through faith and this is not from yourselves, it is the gift of God not by works, so that no one can boast. For we are God's handiwork, created in Christ Jesus to do good works, which God prepared in advance for us to do” (Ephesians 2:8). We at Prince of Peace come together with empty hands to receive Holy Communion, to read and hear God's Word, to worship, to teach and to do good works for His name sake. God tells us in His Word, “don’t give up meeting together, but encourage one another, especially now that the day of his return is drawing near” (Hebrews 10:25). We welcome you to join us at any time. Our members are eager to meet you and to welcome you into our church family. If you desire to become a member and have previously been baptized there is no need to be re-baptized, or if you or your family are seeking to be baptized, then we're here to help you with that too. For information about our worship service, please visit our "Worship Services" page. You can find directions to our church on our "Contact Us / Map" page. Be sure to view our "Calendar" page for all our activities.